160 in stock Need More ? 30 cm p. : chiefly col. ill. Reprint. 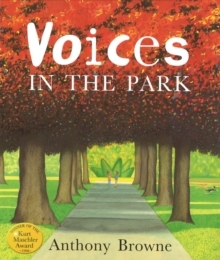 Originally published: as A walk in the park. London: Hamish Hamilton, 1977. Anthony Browne has twice won the Kate Greenaway Medal. Four different voices tell their own versions of the same walk in the park. The radically different perspectives give a fascinating depth to this simple story which explores many of the author's key themes, such as alienation, friendship and the bizarre amid the mundane. Anthony Browne's world-renowned artwork is full of expressive gorillas, vibrant colours and numerous nods to Magritte and other artists, while being uniquely Browne's own style.